So we were at my Gramps 80th Bday bash (haha – now THAT’S an overstatement), and during one of the courses, I noticed there was something funny in the rice dish we were having. It wasn’t a rice dish, more like a rice dish on a platter of assorted Chinese delicasies, but whatever it was, there was, unmistakably, a fly. 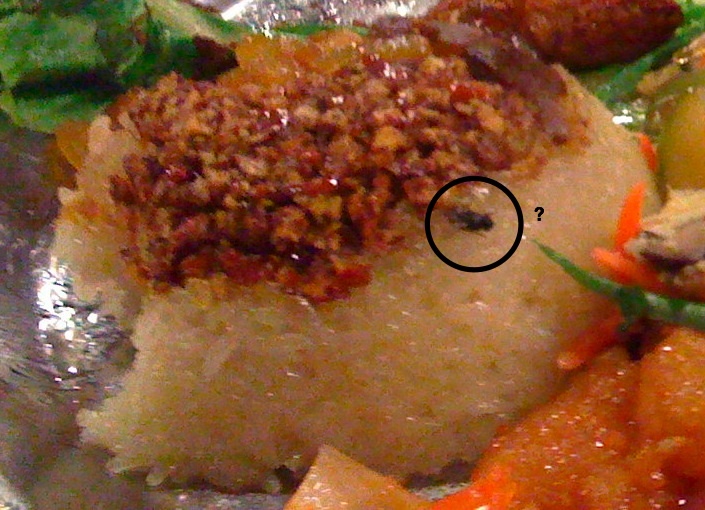 Now, the way the rice was presented meant that the fly had to have been cooked into the rice bowl – or, at least, crushed between the plastic, rice, and whatever the nutty stuff on top is. Needless to say, my cousins and I were similarly grossed out – we only ate the parts of that dish that we liked, and yeah – that was that.